This photograph is from Sherman’s History Portraits series—where she draws inspiration from the history of art. The artist depicts herself in costume, standing in front of printed textiles parted slightly to reveal darkness beyond. She wears a red satin, full length dress, which is cinched by a dark blue sash across the shoulders, just under the bust line, and also well below a seemingly swollen abdomen. A gold sash wraps around her head and neck and drapes over each shoulder. In one hand she holds the head or mask of an old person, with a wrinkled, receding hairline, a large nose and bloodshot eyes. In the other hand, which is bloody, she holds a knife. The figure tilts her head slightly to one side as she gazes at the viewer with a blank expression. The face is artificially made up with thin, arching brows and lips stained red in the center to suggest that they are puckered, as if about to kiss. Bare feet point outward, and appear enlarged in proportion to the rest of the figure. 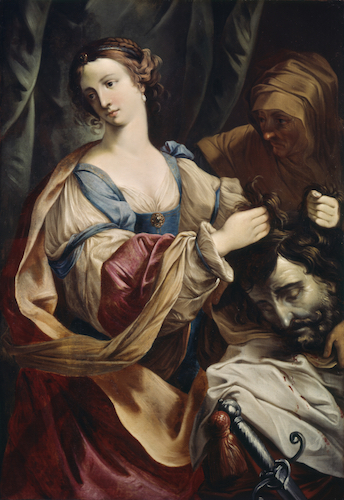 In Untitled #228, Sherman cites the story of Judith and Holofernes—a popular subject during the Renaissance and Baroque periods (especially the 16th-17th century). The Book of Judith (included In some versions of the Bible), recounts the story of Judith, who, to save her people (the Israelites in the town of Bethulia) from the Assyrian King Nebuchadnezzar, entered the tent of the invading general (named Holofernes), who found her attractive. She seduced him into drinking too much, and then beheaded him. In triumph, she brought the severed head back to the Jewish people. For Renaissance and Baroque audiences, the story of Judith and Holofernes symbolized triumph over tyranny (much like the story of David and Goliath). 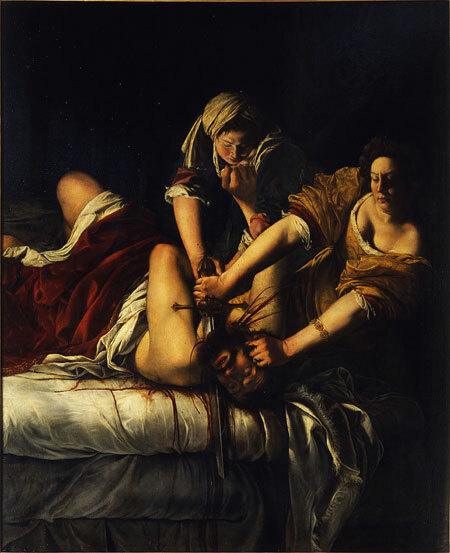 Painters such as Caravaggio, Artemisia Gentileschi and Elisabetta Sirani provided patrons with select stages in the story—at times depicting Judith in the act of severing Holofernes’ head, sneaking away from the darkened enemy encampment while carrying the severed head, or marching forward in triumph, holding aloft the head by the hair, as the citizens of Bethulia look on. Sherman’s photographic interpretation of this subject conflates two of those picture types. While Judith (enacted by Sherman herself) stands, holding the general’s head in a fully lit space, the array of printed textiles draped behind her evokes a middle Eastern motif—referencing Holofernes’ tent. The darkened parting between two cloths implies that Judith has just left. The subject is pushed forward in the picture plane, backgrounded by the row of hanging textiles (this treatment of space is typical of Baroque art of the 17th century). She occupies a shallow stage. Her feet splay outwards, perhaps as a reminder of proto-Renaissance artists’ struggles with foreshortening of forms intended to project towards the viewer (see frescos by Giotto, for example). 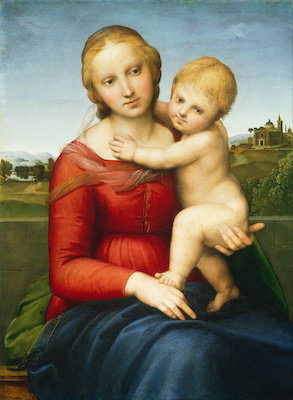 In a nod to Raphael’s many High Renaissance Madonna images (right), the rich primary colors of red, blue and yellow figure prominently, and the two heads, arms and hand form a small, triangular composition within an otherwise vertically oriented format. The suggestion of a swollen abdomen may refer to Renaissance era fashion, in which women’s empire-waisted garments deemphasized natural waists and hips. It may also be a way of conflating the figure of the Virgin Mary of the New Testament—typically portrayed in reds and blues in the Renaissance period—with the Old Testament heroine Judith. Sherman’s work in this series is characterized by the blatant use of props and prosthetic devices. The full mask or head appears to be a store-bought “fright mask” typically used for Halloween. It is a jarringly out-of-place element in an image that historically featured a somewhat younger adult man. Both the rounded belly and the overly large feet are also obvious prosthetic enhancements. Sherman’s facial makeup exaggerates the overall effect of artificiality. 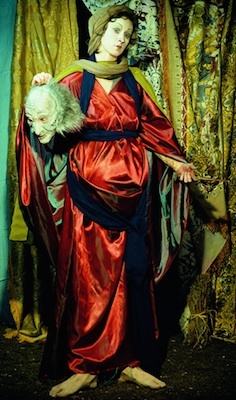 Sherman asks the viewer to consider layers of un-realities, beginning with the props and prosthetics she has employed in the image. Sherman herself is a prop: a real stand-in for the idealized Judiths of art history. As the props undermine the seriousness with which we might consider the scene, the image also questions the complex implications of a violent murder. As in many of the historical paintings, Judith’s hands are bloody, but her garments and face remain clean. Her face—like the bland faces of so many other images of Judith is matter-of-fact, revealing no trace of the grim act that was purportedly committed (the exception to this is Artemisia Gentileschi’s Judith). The direct studio lighting of Sherman’s image dampens the drama and further heightens the artificiality of the scene. The artist invites the viewer to consider how all of these matters converge in a photograph. In the early 19th century, painters struggled to supplant or utilize the technical advantages of photography. Both painting and photography can and do afford the opportunity for invention. By adopting contrivances from prior centuries and adding multiple contemporary contrivances to her interpretation, Sherman’s Untitled #228 both blatantly exposes and provides an art historical context for her contemplations on the nature of narrative and pictorial invention. Cite this page as: Mary Beth Looney, "Cindy Sherman, Untitled #228," in Smarthistory, November 19, 2015, accessed April 22, 2019, https://smarthistory.org/cindy-sherman-untitled-228/.